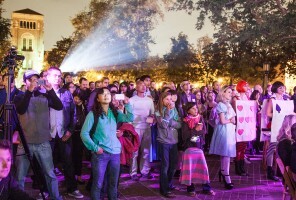 The USC School of Cinematic Arts (SCA) has taken a step forward in its efforts to be the home of the next generation of storytelling technologies. 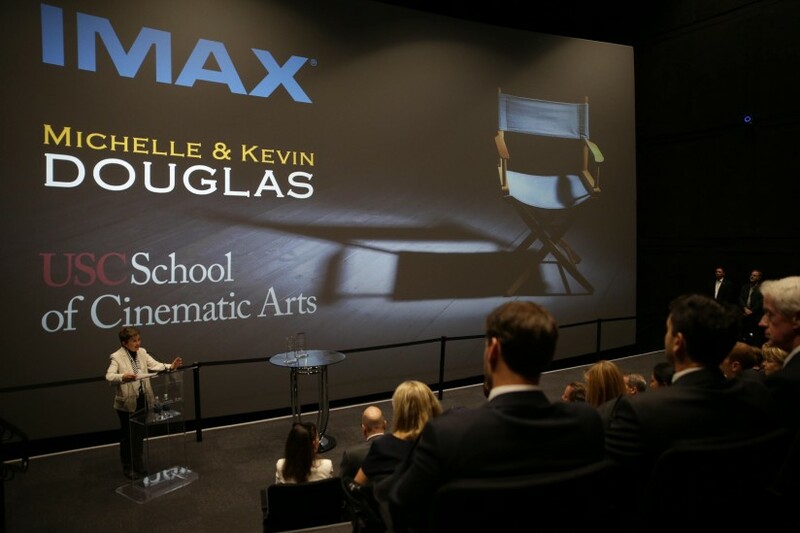 An IMAX Theatre and Immersive Lab, made possible by donations from Michelle and Kevin Douglas and IMAX, opened at the Robert Zemeckis Center for Digital Arts on June 4. The facility is the first of its kind to teach students how to use the latest technology for large format and immersive cinema. “This gift is not only transformative for the research efforts of the school but, most importantly, puts the cutting-edge immersive storytelling, large-format filmmaking and virtual production tools in our students’ hands,” said Dean Elizabeth M. Daley. The 35,000-square-foot facility houses all of the tools necessary for learning and experiencing IMAX. This includes projectors for the left and right eye, giving students the ability to learn how to work with 3-D images; the facility has 50 retractable seats, allowing space for a motion capture volume, a wall space for hanging extra equipment and a ceiling-mounted grid for overhead lights, cameras and sensors. High–speed network connectivity in the theater enables SCA to use the IMAX Lab for emerging experiences, such as streaming real-time live events — a feature unique to the IMAX theaters. Resources at the lab will also help faculty and staff research 3-D technology, integrating IMAX filmmaking into virtual production, location-based entertainment, immersive entertainment experiences, multiplayer game design and more. Students using the lab will learn about immersive storytelling and virtual production in the IMAX medium, as well as large-format filmmaking and advanced storytelling techniques. The idea for the center was first conceived by Robert Zemeckis ’73 and was then achieved by the contributions of Michelle and Kevin Douglas and the entertainment community. “The students’ exploration of IMAX filmmaking and immersive storytelling will push the boundaries of the medium, creating experiences we cannot even imagine yet,” Zemeckis said. The IMAX Theatre and Immersive Lab joins a thriving interactive media culture at SCA’s Robert Zemeckis Center, including a Performance Capture Stage and a World Building Media Lab. “Lewis Carroll Through Two Lenses” is a photographic meditation on the life and career of the renowned author. Documentarian Jamari Perry discusses how she found her voice on her award-winning documentary Soaring on Invisible Wings.